A small farm high up in the Tyrolean mountains gave Nora Poullion her first taste of organic foods. While their father tended to his business in Vienna during World War II, Nora, her mother and two older sisters were safely ensconced in a rudimentary chalet where they lived with a farmer and his wife who baked bread from their own wheat, grew their own vegetables, milked the cows for butter and cheese, and gathered mushrooms from the forest. They were joined there by two old family friends – – Jewish refugees fleeing from the Nazis. These were the experiences that informed the direction of her life. 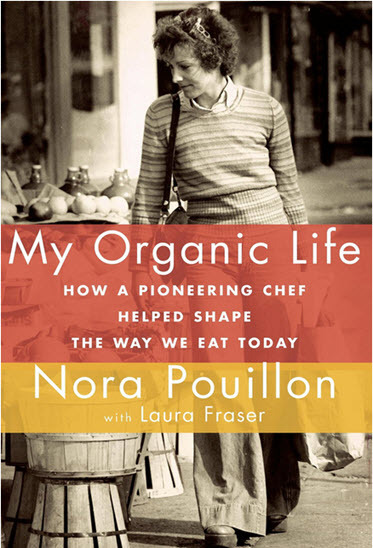 In her poignant memoir Poullion allows us into her private world before she was recognized as an American culinary pioneer through her commitment to local, sustainable and organic food. The book takes us along on her journeys throughout Europe and later in the U.S. at a time that parallels the rise of the organic Food Movement. When food was becoming ever more distant and chefs were buying from huge wholesale suppliers, Nora began to cultivate relationships with local farmers – – something I learned firsthand when I interviewed her seven years ago at the Dupont Circle Farmers Market where she still shops each week for Restaurant Nora, the first certified organic restaurant in the United States. In the book Poullion recalls her arrival in Washington, DC in 1965 with her journalist husband, Pierre. As a young woman and newlywed she didn’t know how to cook. So charged with hosting his many ex-pat friends who excelled at cooking and entertaining, she turned to James Beard’s cookbooks for inspiration. By 1972 she had achieved such a stellar reputation for her French cooking and catering, that she began giving cooking classes. “Ralph Nader was my first student,” she recalled. Area residents who have followed her career will remember her first restaurant inside the Tabard Inn, a small B&B in Dupont Circle. “I was stunned when twenty people came in!” she said of her first lunch service. One year later, after a stint flipping burgers in a local joint (No one can say she hasn’t paid her dues! 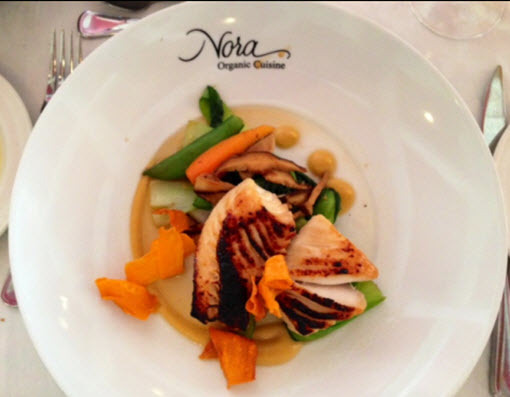 ), she and partner, Steven Damato, and his brother, Tom, opened Restaurant Nora. 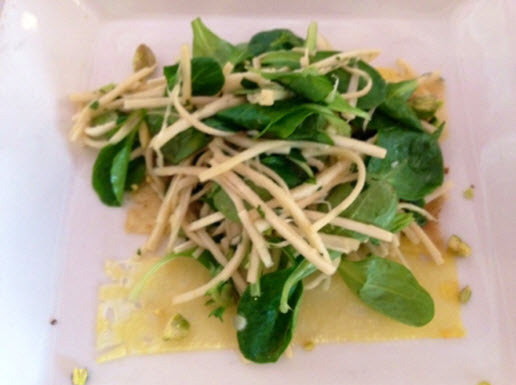 Later the trio enjoyed an eight-year run with City Café before turning it into the since shuttered Asia Nora. On this sunny afternoon she was seated beside her close friend of many years, Diane Rehm, the beloved NPR broadcaster. Rehm is one of the many notables – – from Jimmy Carter to the Obamas – – who have regularly patronized the restaurant. Spread the almonds onto a baking sheet and bake for 8-10 minutes, until fragrant and toasted. Let the nuts cool. Coarsely chop the almonds. Butter an 8-inch spring-form pan with one teaspoon of butter and dust with some of the breadcrumbs. Melt the chocolate in a double boiler over simmering water. Remove from the heat and allow to cool slightly. Combine the butter, sugar, and cooled, melted chocolate in the bowl of a mixer and beat until the batter changes to a lighter color and becomes creamy, about three minutes. Scrape down the sides of the bowl once or twice while beating. Add the yolks, one at a time, and continue beating. Lower the speed of the mixer and add the ground almonds and breadcrumbs. Beat egg whites* (see tips below) until soft but not stiff. Stir a third of the beaten whites into the batter, blending thoroughly. Gently fold in remaining whites, working quickly and carefully to incorporate all the whites without deflating the batter. Pour the batter into the prepared pan and smooth the top. Bake 50 – 55 minutes or until a toothpick inserted in the center comes out clean. The center of the cake can still be soft. Allow the cake to cool in the pan for 10 minutes before turning it out onto a cake rack. Let the cake cool completely before adding the glaze. Serves 12. Melt semi-sweet chocolate in a double boiler over simmering water. Add the butter and stir until blended and smooth. Remove the glaze from the heat and allow it to cool and thicken to the consistency of thick cream. Brush the cake to remove any loose crumbs, and place both the cake and the cooling rack on a sheet pan to catch the chocolate glaze. Slowly pour a pool of chocolate glaze onto the center of the cake. Working from the center out, use a long metal spatula to spread the glaze evenly over the top and sides of the cake. For a smoother look, you can glaze the cake a second time. Scoop the excess glaze from the sheet pan and reheat it in a small double boiler. Pour it through a sieve, if necessary to remove any cake crumbs, and cool it slightly to thicken a bit. Pour the glaze again onto the center of the cake and allow it to spread without using a spatula. With a vegetable peeler, shave off some curls of the milk chocolate and sprinkle them on top of the cake. Allow the glaze to set for 2 hours at room temperature or at least 20 minutes in the refrigerator. Whip the egg white until it holds its shape. Whip the cream in a separate bowl until it forms soft peaks, then add the sugar. 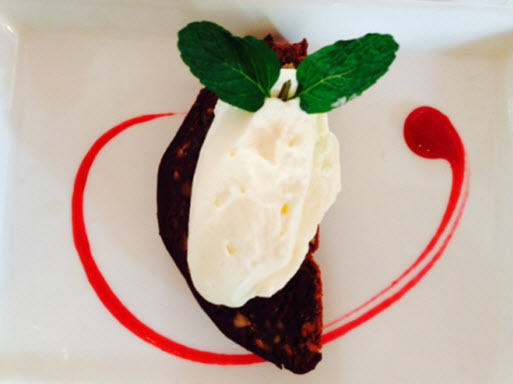 Continue to whip the cream until it forms soft peaks again. Fold the egg whites into the cream. Assembly: Cut 4 pieces of the cake and put one piece on each of four dessert plates, garnish with a dollop of the light whipped cream and a sprig of mint. This is my grandmother’s recipe for a traditional Austrian cake, called Rehrueken. The name means “venison saddle” because the cake is usually baked in a long, half-roll pan to imitate a saddle of venison. No matter what you do, this cake never fails. Under-baked, it tastes like a brownie. The original Viennese recipe uses almonds, but sometimes I make an Italian version, substituting pine nuts and serving it with an Amaretto cream or ice cream. I have made an American version using pecans and a bourbon whipped cream or ice cream. The simple glaze always works, and my customers and family love it. Our neighbor in Vienna, the daughter of a famous restaurant owner, gave me this glaze recipe. You can flavor the whipped cream with any kind of liqueur or with a few drops of pure vanilla, honey, rosewater or a pinch of cinnamon. It is important not to over-beat the egg whites. Whip them just until they keep their shape. If over-beaten, they are difficult to fold in thoroughly and over-beaten eggs can cause the cake to rise too high, crack, and fall as it cools.